In his latest column, Ceasefire's art critic, Daniel Barnes, reflects on Martin Creed's work, on the occasion of the artist's comeback exhibit, paying tribute to a subtle, quiet genius. 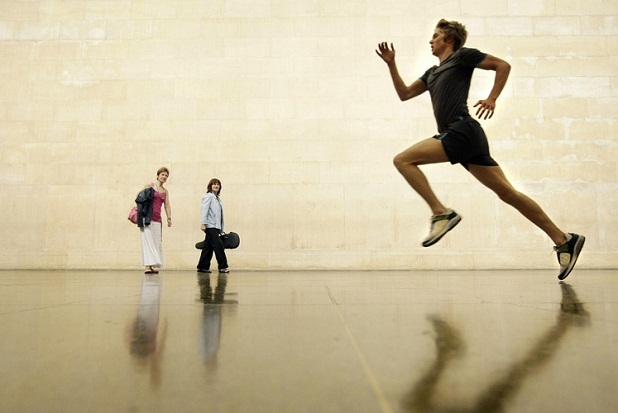 My first encounter with Martin Creed was through his 2001 Turner Prize winning work, The lights going on and off. Since then, however, he has slipped in and out of my consciousness as if his career were a curious dream, leaving me perpetually uncertain as to whether the man is a subtle genius or an occasional break from artworld absurdity. This tussle of intellectual conscience has, I think, finally been resolved by his latest work, which demonstrates that great art is quietly lying beneath our feet in the very matter of the earth itself. Indeed, Creed proves that subtlety and simplicity are the keys to creating art that inspires primal delight in our experience of the dreary world. The lights going on and off is a good place to start if we want to understand how Creed’s genius might escape us and why his work is so important. To my mind, this completely empty room with florescent strip lights that flicker on and off is a great work of art; indeed, I am willing to risk hyperbole and say it was the first truly great artwork of the twenty-first century. The YBAs brought contemporary art to the attention of the public, even perhaps to the attention of the so-called ‘general public’ as never before, by often employing shock tactics. Dead stuff, bodily fluids, sexual deviance and rude words forced people to take notice of this thing called art. The lights going on and off is interesting because it roused a comparable wave of reactions but in a completely different way: instead of being vulgar or composed of some improbable detritus, it is simply nothing, similarly leading to the usual round of ‘is it art?’ debates. It is a quiet, understated work that does not shout or scream but merely flickers between light and dark in the cosmic emptiness of the gallery. If Hirst and Emin shocked in the way that, say, Warhol did with bold statements and brash interrogations of artistic materiality, then Creed shocked as Michael Craig-Martin did with An Oak Tree – with minimalism. Minimalism was, of course, not -at that time- new; it had an illustrious precedent in art from Malevitch and Mondrian through to Carl Andre and Donald Judd, not to mention in the architecture of Le Corbusier and the Bauhaus. In 2001, timing was key to the effect, since the artworld was flooded with outrageous work, so Creed surprised us with much less than we had come to expect from our contemporary artists. It is this minimalism that accounts for how one might neglect, or even forget, Creed. 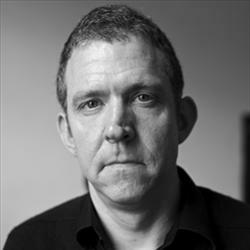 If you operate only at the surface of the contemporary artworld, relying on the newspapers, national organisations like the Arts Council, the big art museums and Nicholas Serota’s regular pronouncements about cultural heritage, then Creed will quickly vanish from consciousness because his work is not surprising enough to sustain interest from the sensation-seeking masses. Even if you trawl around the small commercial galleries and swan about the private views of artists whom no one has ever heard of, the sheer volume of art and its rabid proliferation can make you forget what’s really noteworthy, especially when you have seen so much work which is trying too hard. Creed does not, in short, shout loudly enough, so his voice gets lost in the crowd, which leads to our being blinded to the importance of his work. Great art should inspire us to think about our lives and the world, to consider our existential positions and lead us to resolve intellectual quandaries by offering us new ways of looking at things. It should also cultivate aesthetic experiences that nothing else could offer, which engage the mind and the body in tandem. Creed’s work is important as much more than an antidote to the poisonous noise of contemporary art precisely because it generates ideas and experiences in the audience without being intrusive or seeming to try too hard. The flickering lights could be missed as we walk through the room concluding that there is nothing to see but a faulty light, which requires that we stop for a moment and allow ourselves to be immersed in the atmosphere this installation creates. In so doing, the mind wanders to think about the nature of art itself, or to imagine a fearful scenario to which we are unwittingly privy. Creed manufactures a singular converge of ideas and experiences by simply interrupting the motions of both art and everyday life. The latest work to demonstrate this talent is Work No. 1059. 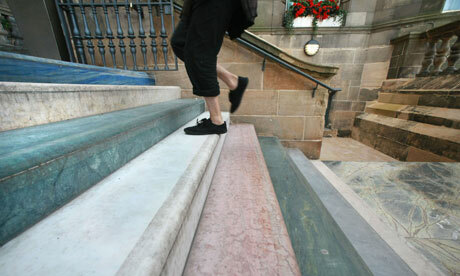 As part of the Edinburgh arts festival, Creed has installed – or rather replaced – the dingy, pedestrian Scotsman Steps with fine marble in an array of sumptuous colours. On one level, they are just steps, a means of getting from one place to another, which are used by hundreds of people every day to go places. On another level, Creed has transformed them into a work of art so deeply enmeshed in the living world that you might miss it. It is only by deliberately paying attention that you begin to see its beauty, which is in the colour, texture, craftsmanship that makes walking a suddenly delightful experience. With the greatest subtlety, Creed transforms something ordinary into a majestic experience that makes one believe that the world and everything in it might just be alright because it is adorned with a little gem. This demonstrates Creed’s genuine achievement once and for all. Sometimes art leads us to look at things differently, but most of the time – in Western art, at least – it only really makes us look at art differently by challenging us to think about what art is and what its value is. Creed, however, produces art that enables us to look at the world differently by offering works that are fully integrated with the world. Strip lights and steps are parts of the world, which Creed manipulates relatively scantily in order to switch our attention from the lofty claims of art to the more mundane aspects of our existence. The effect is achieved with so little effort that it is easy to forget, but every time Creed pops up with a new intervention, it is impossible to decline the invitation to reconsider the world anew.